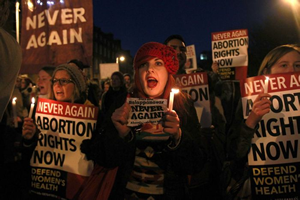 Ireland has begun to tread the path towards legalising abortions in certain strict circumstances. The decision, reached last night by the Irish cabinet, follows the death last year of Savita Halappanavar. Ireland has begun to tread the path towards legalising abortions in certain strict circumstances. The decision, reached last night by the Irish cabinet, follows the death last year of Savita Halappanavar. At 17 weeks pregnant, she sought medical help from University Hospital Galway as she was showing signs of a miscarriage. Whilst the hospital said that the foetus was not viable, they nevertheless argued that they could not perform an abortion under Irish Law as the foetus’s heart was still beating. Halappanavar was eventually diagnosed with septicaemia, which led to multiple organ failure and her death. The death sparked protests across Ireland, England and Ms Halappanaver’s home country of India, and led to a decision by ministers to review the country’s abortion laws. The draft legislation published last night seeks formally to address the 1992 X Case, a legal ruling which established the right of Irish women to an abortion if a pregnant woman’s life was at risk because of the pregnancy, including the risk of suicide. Under the proposals agreed by Irish ministers, RTE reports that terminations will be allowed when there is a “real and substantial threat to the life of the mother, including the threat of suicide”. “The draft bill states that terminations must be carried out in public obstetric units, except in emergencies, when a single medical practitioner can approve an abortion. “In the case of a risk of loss of life from physical illness, two doctors must certify that there is a real and substantial risk to the mother’s life. “In the case of a risk of suicide, three doctors must jointly sanction an abortion – an obstetrician and a psychiatrist from the hospital involved, and another psychiatrist. “The proposed legislation sets out a clear legal framework for women and for medical practitioners in Ireland. The development has unsurprisingly sparked controversy, with Brian Walsh, a TD for the Taoiseach Enda Kenny’s own Fine Gael party, calling for the proposals to be put to a referendum. Writing for the Irish Independent, meanwhile, the former Taoiseach and leader of Fine Gael, John Bruton, has warned that the proposals are tantamount to a dangerously slippery slope. “Introducing a law that would say a threat of suicide was a ground for abortion is not something that should be done under the pressure of artificial deadlines. “I know of no other area of law where a threat of suicide is sufficient to make legal what would otherwise be illegal. “The notion that a simple threat of suicide would make right something that would otherwise be wrong is a really dangerous principle. “We must think long and hard about where it might lead.